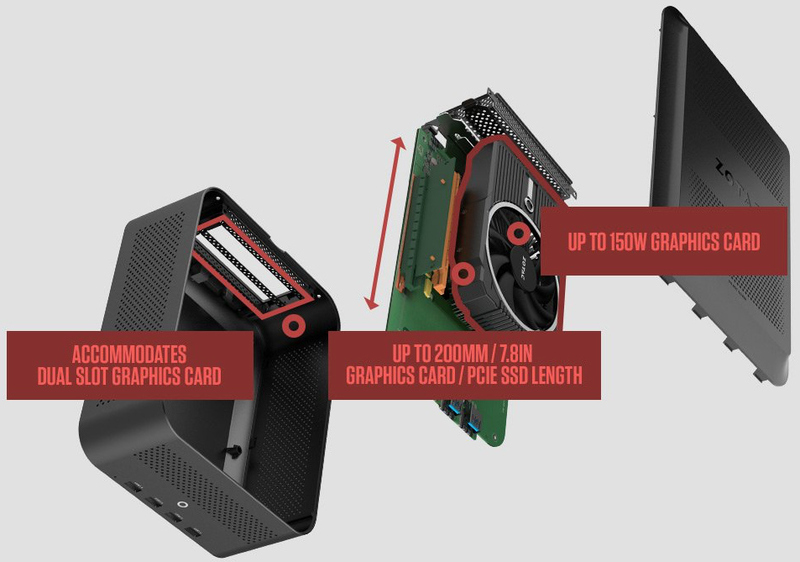 ZOTAC has been working on its external chassis for graphics cards with a Thunderbolt 3 interconnection for well over a year now. Apparently, according to ZOTAC, the time it spent was worth it. 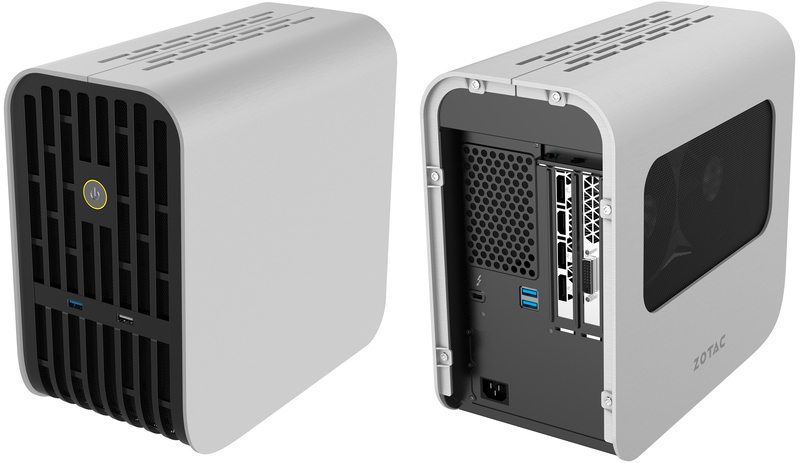 On Thursday, the company announced not one, but two eGFX TB3 enclosures targeting different audiences and offering different features. The AMP Box is designed for those demanding maximum performance, whereas the AMB Box Mini is aimed at people seeking a quiet and portable solution. About 1.5 years after the first external chassis for graphics cards with TB3 emerged, the market for such solutions seems to be doing quite well and so it begins to segment into niches. Initially, companies like ASUS, AKiTiO, PowerColor, Razer, and others only offered eGFX boxes for large desktop graphics cards offering maximum performance and consuming a huge amount of power. Then we saw GIGABYTE and GALAX/KFA2 launch rather compact eGFX chassis with pre-installed graphics cards targeting casual users who do not want to assemble anything themselves and do not want and an add-on component that is larger than an SFF PC. Now ZOTAC is releasing two separate solutions (another signal that the market is well established): the AMP Box for DIY enthusiasts that is compatible with high-end graphics cards, and the AMP Box Mini for owners of ZOTAC’s tiny ZBOX computers with a TB3 port as well as everyone who wants a compact eGFX enclosure. The large ZOTAC’s AMP Box uses aluminum chassis that can accommodate a dual-slot graphics adapter that is up to 228.6 mm (9”) long and with two 8-pin PCIe auxiliary power connectors. It should be noted that most high-end reference graphics cards from AMD and NVIDIA are around 31.2 cm (10.5") and they are not going to fit into the AMP Box. Therefore, those who plan to use it will have to get "mini" versions of the GPUs from ZOTAC or other manufacturers. To ZOTAC's credit, it should be noted that the AMP Box is a bit smaller than its competitors from ASUS, AKiTiO or PowerColor. The eGFX TB3 enclosure is equipped with a quad-port USB 3.0 hub (two ports on the front, two on the back, one supports Quick Charging) as well as a 450 W PSU (it is unclear whether we are dealing with a standard, or a custom unit here) to guarantee compatibility with ultra-high-end video cards that need more than “standard” 250 W. Given the wattage of the power supply, it is likely that the AMP Box can also charge a laptop when in use, but the maker has yet to confirm it. Since the AMP Box was designed for demanding gamers, it is also equipped with ZOTAC’s Spectra programmable RGB lighting so to add some shine to its grey aluminum outfit. The smaller ZOTAC AMP Box Mini that comes in black metallic chassis only fits in dual-slot add-in-cards that are up to 200 mm (7.87”) long and need a single 6-pin PCIe power connector. The manufacturer proposes to use this enclosure for entry-level graphics cards or even high-capacity SSDs. Considering that ultra-compact form-factor desktops, as well as many notebooks, come with rather mediocre CPUs that are barely designed to run demanding games, mainstream graphics cards will be optimal for such systems. Moreover, those who need to attach a laptop or a tiny desktop to three or four monitors do not need maximum performance in games, so this AMP Box Mini may end up quite popular among such users. The design of the enclosure is similar to the design of ZOTAC’s MI553 SFF PC, but the box itself is compatible with all of the company’s UCFF systems with a TB3 port, including the CI549 nano, MI549 nano, MI552, and MI572. 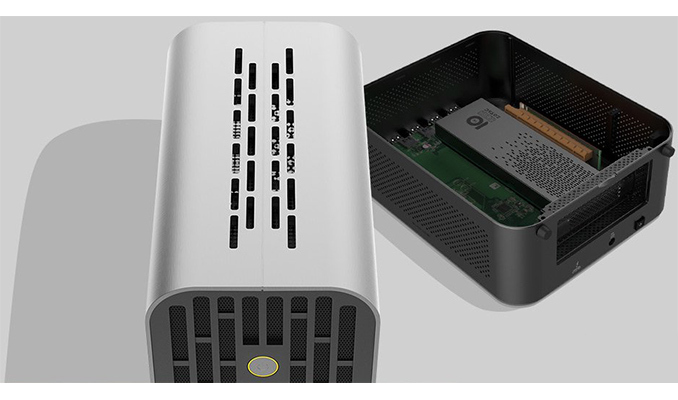 ZOTAC plans to demonstrate the AMP Box and the AMP Box Mini eGFX enclosures at CES next month. The units are expected to hit store shelves sometimes in Q1 or Q2, but their exact prices are unknown. Well, not an i5 "I" but certainly an i5 "M"
The U series through the 7th gen, even the i7's, were pretty weak. The 8th gen U-series changes everything...the 8th gen i5 is around 30% faster, on average, in games than even the previous 7th gen i7's. Can someone explain this to me (from Zotac's page): 'Thunderbolt 3 offers up to 40 Gbps bandwidth, 3x more than USB 3.1 Gen2', and then there's an image showing Thunderbolt at 40Gbps and USB 3.1 at 10Gbps. What I'm wondering is: 10 x 3 = 40 ? So they've bought out a box to put your graphics card in, how quaint, except it doesnt fit the standard large size card people would want to fit it with, but yet the box with its PSU is the size of several graphics cards put together and when adding the measurements onto a SFF setup means we might as well provide space for an ATX box anyway (or at least mATX).